Emotions, instead of something to manage or get rid of, are portrayed as magnificent sources of power to fulfill one’s innately good purpose for being on Mother Earth at this time. 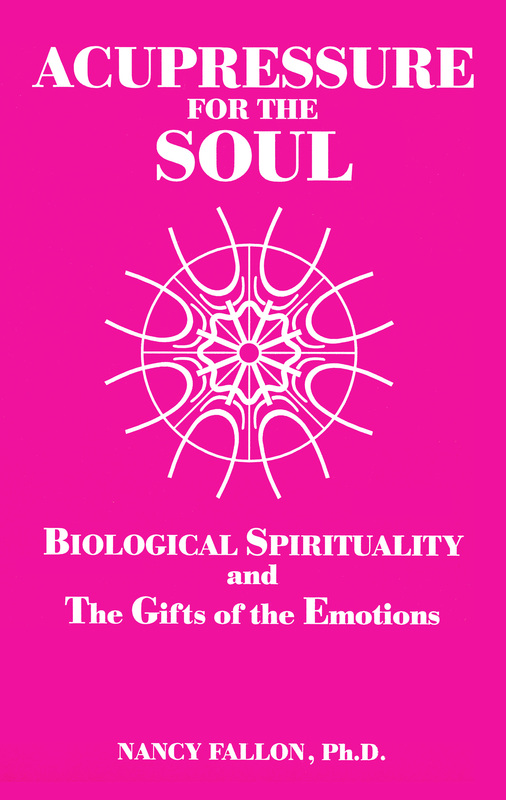 The ancient teachings of Oriental medicine, combined with the author’s knowledge and personal Shamanic-like experiences provide the reader with a unique formula of how to experience biological spirituality and utilize the gifts of the emotions. Submitted by Julie Fariel on Wed, 12/03/2008 - 14:35. Submitted by Anonymous on Fri, 11/21/2008 - 14:34. This book explains how the emotions develop from conception through adolescence. It points out how crucial emotional development is to a person choosing to lead a altruistic, cooperative and creative life resulting in a person being naturally moral, automatically considerate of others and having a healthy passion to fulfill his or her purpose in life. Acupressure for the Soul By Nancy Fallon,Ph.D. Submitted by Anonymous on Tue, 09/07/2010 - 18:25. There is an important part of this book missing. It is in Appendix Two, Emotional Energy Development Chart Expanded. The Ways To Heal are missing from the AGE: Preschool (Age 3 through 5, or until second teeth come in) the independent stage. They should be at the top of page 143, but they are not. I would really like to have this info, as it is the main age that I bought the book. If you could provide it to me I would greatly appreciate it.